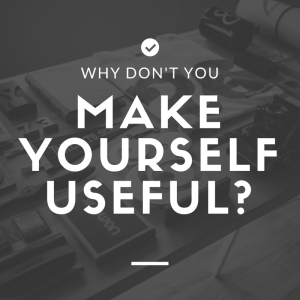 Why Don't You Make Yourself Useful? When you’re in a business that offers any kind of ongoing service or product, one of the most important things to track is “churn”, or how many users are quitting. The more people that quit, the less money you’re taking in. I’ve been in many discussions about different “techniques” or “tricks” to help keep customers on when they might quit. Like sending them a free gift shortly before renewal, adding in new bonuses, or even something as basic as emailing them stories of how OTHER people love your product / service. Now hang on, don’t get upset at me. Sure there are a few people selling stuff that’s genuinely not very good and there’s no solution for that except to go back and build something better. But most of the time, I think we simply don’t make it easy enough for customers to find the usefulness. For software, that means it’s too hard to use. Or too hard to set up. Or takes too much work to get value from it. For content or training, maybe it’s confusing to find what you need. Maybe it’s too time consuming to go through. Maybe it’s not broken up into consumable pieces. Like for me, I don’t appreciating being forced to watch a 60 minute video to find the one piece of information I need. Written content is a lot easier to search or skim. So I’m not big into stuff that’s one long video after another. What I’ve learned in the software business is that the best thing you can do is deliver as much usefulness as possible with as little work. Make your tool WORK without people having to do a lot. Make it keep working even if they get distracted with other things or just life in general. If your product or service STARTS being useful without much hassle and KEEPS being useful without the customer having to pay attention, you’ve got a winner. That’s the philosophy you’ll see behind SocialAdr. We’ve tried to lower the number of hoops our users jump through to get started. And we’ve designed the whole service so that as long as you have credits, it just keeps doing its thing, even if you don’t check in on it for a week or a month. It’s USEFUL for customers without being much work. How can YOU improve your start-up process to get customers to “useful” faster? How can you make sure that you keep delivering value even if they don’t have a lot of time and energy to put into it? Remember, even if you ignore your account, we’ll keep churning out social signals for you.